Hospitality Room: where everyone gathers! Kubasaki High School was located on Okinawa. 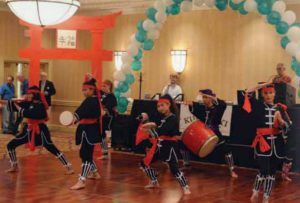 For a “Brat” reunion (“children” of military personnel) in Fairfax County, Virginia, reunion planners decorated their Hospitality Room with a Japanese theme and colors. They made a large cardboard tori (ceremonial gate outside Shinto temples), painted it red and it was the centerpiece for the Hospitality Room.Here a Japanese drum troop entertains. How big a room do we need? What have you seen other groups do to make theirs special? A: The Hospitality Suite is typically the heart of any reunion, and the part of the hotel where most attendees — ideally, all of your attendees! — will spend a good part of their time. So let’s take a look at all three of your questions. First, the term “Hospitality Suite” is something of a misnomer. What you really want is a Hospitality Room, where everyone can gather and socialize. Most likely, your group will be too big for even a large suite of rooms on the hotel’s guest room floors. What you want is a meeting / function room located among the hotel’s public spaces. The room should be large enough, everyone can occupy it at the same time. This is where folks will go to find other members of your group, where people will sit and socialize, have snacks and beverages, play cards or games, and look at memorabilia. A good rule of thumb is that the Hospitality Room should have approximately 1,000 square feet of space for every 50 to 60 people in your group. This allows folks to move among the furniture, refreshment and memorabilia tables without the room feeling “tight” or overcrowded. Some hotels can bring in couches and armchairs for additional comfort but you’ll want to check the cost. Some properties have special meeting rooms already equipped with comfortable furniture. Having couches and armchairs is particularly nice if you’re going to have a large number of seniors attending. The hotel should be able to lock the room, so you can safely leave personal belongings and memorabilia when the room is not in use. You’ll want to have snacks and light refreshments; at a minimum, coffee, sodas and water. The hotel can provide these at a cost or you can negotiate in your contract for permission from the hotel to bring these items in yourself, without additional charge. Your Hospitality Room is a great place to show still photos, videos and old home movies from the past. Many reunions have a member compile a family, class or unit history video, which can be shown in an endless “loop” on a large-screen video monitor. Negotiate with the hotel to provide a monitor / DVD player at a reasonable cost, or negotiate the right to bring in a monitor / player from a local supplier. An added bonus is that teenagers can use the monitor to play video games. Playing cards, board games, and coloring books are inexpensive and fun items to have on hand, especially games that members may have played together in years past. Many classic board games from the 1950s, 60s, and 70s available for sale online. Decorating the room always makes the reunion more fun and more memorable. Choose a color scheme or a theme that will be fun for your group. I’ve seen hospitality rooms decorated with many delightful themes, including a 1950s malt shop, blue and gold for a Navy reunion, sports themes (baseball, football, auto racing, etc. ), a beach party, a road rally of classic cars, a Mexican fiesta, and on and on. Your hotel should be able to provide table linens in your requested colors, and many themed decorations can be inexpensively purchased at dollar and party stores, or online. In short, let your imagination go, and have fun! Dean Miller, national sales director for VisitFairfax (fxva.com), the convention and visitors bureau in Fairfax County, Virginia, is a great friend of reunions. Call him when you are planning a reunion in the Washington, DC, area. Fairfax County is nearby, affordable, and conveniently located to all the area has to offer. Contact Dean at 703-790-0643; dmiller@fxva.com. Previous ArticleHail the pre-con meeting!